Kwei Quartey was born in Ghana and raised by a black American mother and a Ghanaian father. A practicing physician, he lives and works in Pasadena. He is the author of two other critically acclaimed novels in the Darko Dawson series, Wife of the Gods and Children of the Street. "Offers a more contemporary portrait of corporate greed on the continent than McCall Smith’s gentle portrait of rural crime." "In the context of a world still working on cleaning up the Gulf of Mexico oil spill, and where oil companies’ main hope of expansion comes from high-risk deep water drilling, Quartey’s message could not be more timely." "Quartey portrays a the country of Ghana with all its charms and quirks, a culture that stands at the brink of the modern world, yet has not lost its tribal traditions. The result is a thoroughly fascinatng book." "Quartey’s mastery of the art of misdirection serves him well in his third mystery featuring Accra, Ghana, homicide detective Darko Dawson ... A complex plot, combined with a warts-and-all lead and an evocative portrayal of the author’s native country, add up to a winner." "Fans of Alexander McCall Smith’s “No. 1 Ladies’ Detective Agency” series will enjoy the African setting and the large cast of interesting characters, while the twists and turns of Quartey’s plotting will satisfy any choosy mystery fan." 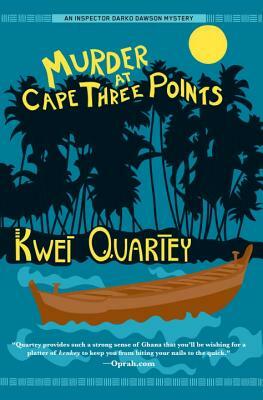 "Kwei Quartey writes incredibly well about Ghana, about crime, and about the people he has created. If you're an armchair traveling sleuth like I am, I advise you to add him to your list of must-reads." "I particularly appreciate being able to travel there [Ghana] in this way, through the eyes of an author who experiences multiple cultures, and a police officer who has reason to challenge his environment." "Kwei Quartey does what all the best storytellers do. He takes you to a world you have never seen and makes it as real to you as your own backyard. Inspector Darko Dawson is relentless and I look forward to riding with him again." "An absolute gem of a first novel and the sort of book that will delight not only hard-core mystery fans, but also those who visit the genre only casually in search of an occasional literary entertainment.... Wife of the Gods undoubtedly will be compared with Alexander McCall Smith's phenomenally successful No. 1 Ladies' Detective Agency series, but Quartey's debut is—to this reader, at least—a far richer and more sophisticated experience." "[A] crisp, engrossing debut.... [Quartey] renders a compelling cast of characters inhabiting a world precariously perched between old and new. Fans of McCall Smith’s No. 1 Ladies’ Detective Agency novels will relish the opportunity to discover yet another intriguing area of Africa." "Quartey convincingly portrays the seedy underbelly of Accra, Ghana's capital city.... Quartey cleverly hides the culprit, but the whodunit's strength is as much in the depiction of a world largely unfamiliar to an American readership as in its playing fair."